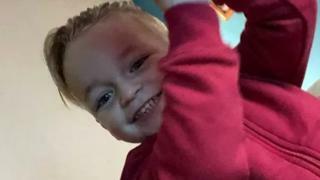 A three-year-old boy died after his mother’s boyfriend pushed his car seat back in a “fit of childish temper”, a court has heard. Stephen Waterson, 25, allegedly crushed Alfie Lamb either because he wanted more leg room or because he was annoyed, Duncan Atkinson QC said. Adrian Hoare, 23, failed her son “fundamentally and fatally” during the car journey from Sutton to Croydon on 1 February, the Old Bailey was told. The couple deny Alfie’s manslaughter. In a closing speech, prosecutor Mr Atkinson described Alfie as a “happy, active, smiley child” and said “no-one is going to suggest either of these defendants wanted Alfie to die”. He added: “Neither of them set out to hurt him in the way that they did. “The question for you is whether Alfie died because without any thought for the consequences Stephen Waterson moved his chair back, whether because he wanted more room or because Alfie was annoying him, putting Alfie at risk, lashing out at him with his car seat in a fit of childish temper. Mr Waterson is accused of pushing the front passenger seat of his Audi into Alfie twice during the journey. Ms Hoare, who is originally from north Kent, denies manslaughter, child cruelty and common assault on Emilie Williams, who was in the car. Mr Waterson, the son of former government minister Nigel Waterson, has pleaded not guilty to manslaughter and intimidation of the car’s driver Marcus Lamb.